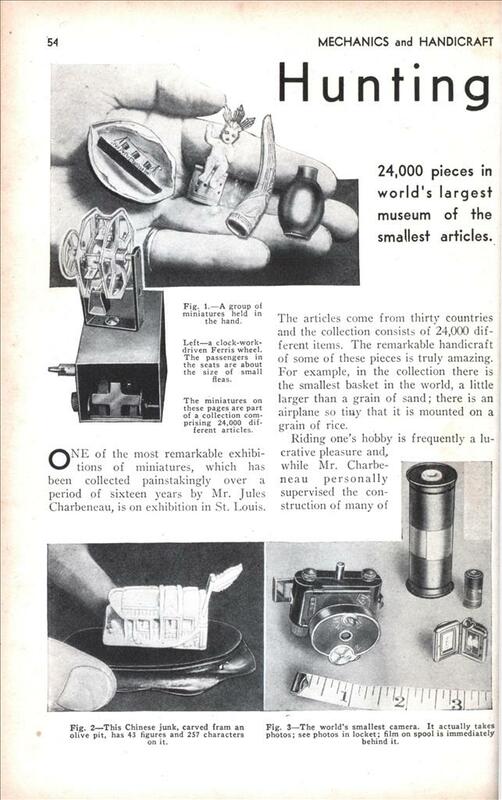 24,000 pieces in world’s largest museum of the smallest articles. ONE of the most remarkable exhibitions of miniatures, which has been collected painstakingly over a period of sixteen years by Mr. Jules Charbeneau, is on exhibition in St. Louis. The articles come from thirty countries and the collection consists of 24,000 different items. The remarkable handicraft of some of these pieces is truly amazing. For example, in the collection there is the smallest basket in the world, a little larger than a grain of sand; there is an airplane so tiny that it is mounted on a grain of rice. Riding one’s hobby is frequently a lucrative pleasure and, while Mr. Charbeneau personally supervised the construction of many of his own curiosities, the pieces in his museum are considered priceless today. The collection was started at the Paris exhibition in 1900. Since it was first shown in 1933, more than 2,000,000 people have viewed it. Some of these miniature pieces, shown on these pages, will be described in greater detail. In the hand in Fig. 1 is a model of the Normandie contained in a half walnut shell; to the right the “Infant Jesus”—both carved from ivory; the fingernail guard (which was used to protect the fingernails) is made from tortoise shell, and the Chinese lady’s snuff bottle is painted on the inside. Immediately below is a device which could be characterized as a flea Ferris wheel. (The photograph has been enlarged.) This Ferris wheel runs by clockwork in the base. The figures in the seats, barely noticeable in this photograph, are the size of a flea. A Chinese junk carved from an olive pit, covered by 43 figures and 257 characters, is shown at Fig. 2. The carving is mounted on a block of ebony. What is probably the world’s smallest camera is shown at Fig. 3. This camera actually takes pictures; two of the resulting pictures are found in the tiny locket alongside. The roll of film which this camera uses is shown alongside a regular roll. The tape measure in the foreground will give one an idea of the size of the various parts. Alongside the familiar pecan (Fig. 5) is a grain of rice from which two figures have been carved; and at Fig. 6 is a tiny electric motor which would easily fit on the head of a lead pencil (it actually works!). Here it is shown encircled by a man’s finger ring. At Fig. 7 is what is considered to be the smallest radio cabinet, shown beside an ordinary paper of matches. Amazing, an entire museum you could steal wearing nothing but a plum smuggler.